The RSW/US-Mirren 2017 New Business Tools Annual Report is an essential resource for agencies. As tools and technology continue to play a greater role in agencies of all disciplines, it’s important to understand the value of each as it pertains to driving growth. 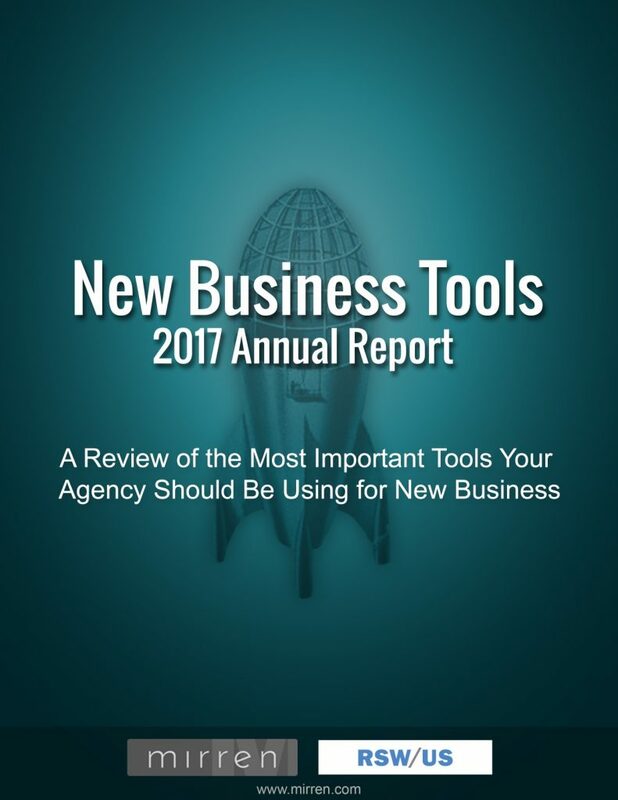 Now in its fifth year, The New Business Tools Annual Report summarizes the findings from nearly 400 US agency executives on the use and effectiveness of tools across a wide range of categories that are most critical to an agency’s new business function. The categories were determined based upon usage rate trends from previous reports. Agency executives can leverage this report to inform new business tool usage, best practices and investment decisions. It’s also a good resource to understand what’s lacking when it comes to each tool and what needs to be developed further. This year significant changes were made to provide a deeper assessment of the effectiveness of each tool examined. This included measuring the effectiveness of tools across customized variables identified as being most pertinent to its new business effectiveness. Mirren Business Development and RSW/US’s respective databases of senior agency executives were used for this study. The study was fielded in March and April 2017.